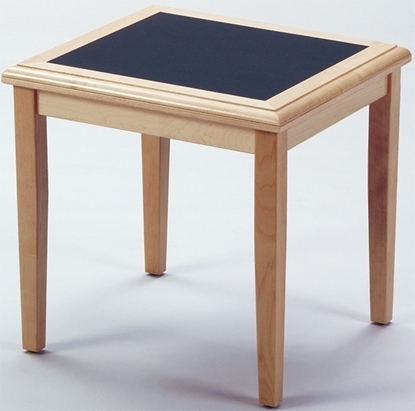 In need of a table that will provide guests or employees a designated area to enjoy reading materials or drink beverages like tea or coffee? Furniture Wholesalers carries a wide variety of office coffee tables that are sure to aesthetically please your guests and employees. We carry several designs from low wood coffee tables to long coffee tables and everything in between. The Lesro Mystic Series features sophisticated and contemporary styling. This end table compliments the series beautifully with its clean, modern lines. It is a great addition to any waiting room or office lounge. A perfect match to the Gansett seating series but versatile enough to be used in any setting. This end table is a great addition to any waiting room and seating area and features a stylish sled based frame. The free standing Contour end table is the perfect compliment to the Contour reception area series. Offered in 6 different wood finishes that make it a good choice with many different contemporary office settings, whether in your waiting room or private office. 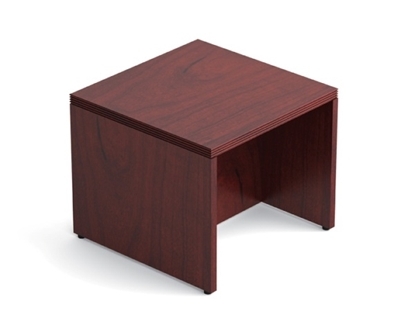 The Lesro Madison Series End Table features a solid hardwood construction and is available in 6 wood finishes. With its clean lines, it works well in most any contemporary waiting room or private office settings. 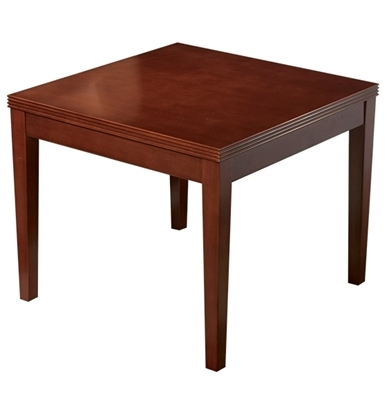 A modern table with good versatility, this reception room end table is part of the Lesro Somerset collection. Available in 6 solid wood finishes, it features an inlaid laminate top providing a durable surface for drinks and reading materials. Part of the Lesro Brewster Series, this contemporary end table is constructed of selected hardwoods. The laminate inset top provides style and durability. Offered in 6 wood finishes, allowing you to coordinate with other reception room furniture. 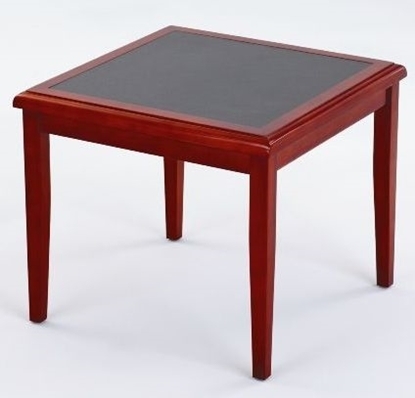 Manufactured of genuine wood veneer, this 24" Ventnor series end table coordinates with matching Ventnor coffee table. Its style compliments other waiting room chairs and lounge furniture. This free standing coffee table is the perfect compliment to the Lesro Contour reception area series. With its 6 available wood finish offerings, it also will go beautifully with most chair and sofa groups. The Somerset corner table is styled beautifully. It has a radius edge detail with a durable laminate inset top. Great for a waiting room or office lounge area. This coffee table is from the contemporary Lesro Mystic series. It just doesn't look like every other table. Made to coordinate with Mystic chairs, it will compliment your waiting room or reception area decor. A great addition to any reception or seating area, this end table features a lower storage shelf, a 1 5/8" thick surface that sits on chrome standoffs to give a floating appearance, and is available in three colors. A perfect match to the Gansett seating series but versatile enough to be used in any setting. This coffee table is a great addition to any waiting room and seating area and features a stylish sled based frame. 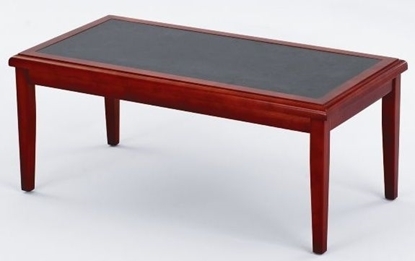 The Lesro Madison series coffee table features solid hardwood construction. 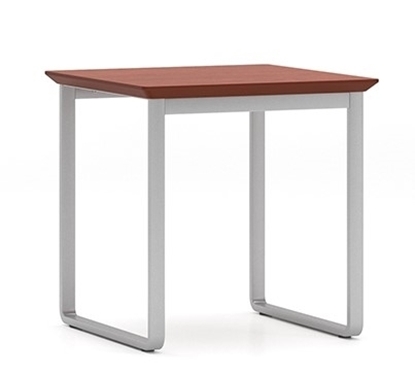 With its clean, contemporary lines and 6 wood finishes, it will coordinate well with most waiting room or private office settings. Complete your waiting room or office lounge with this contemporary coffee table. The Lesro F1455T5 radius edges provide a safe and clean look. Features an inset laminate top that adds style and durability. Choose from 6 wood finish colors. 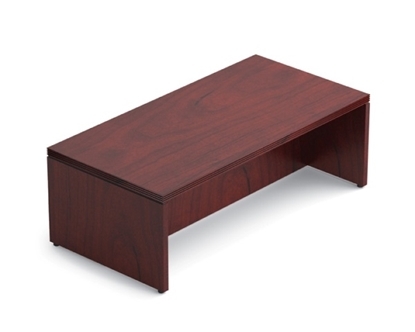 A 24" wood veneer end table featuring a fluted edge designed to match the KEN19 coffee table. 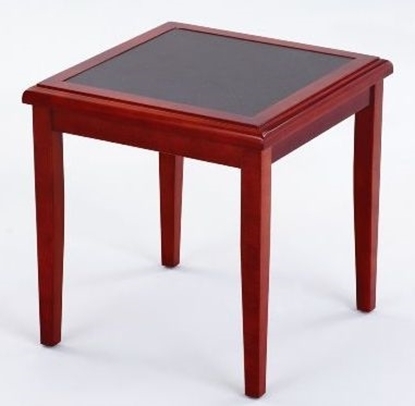 The Office Star Kenwood end table is versatile enough to be used in almost any waiting room, private office or lounge setting. This Ventnor coffee table emphasizes sophisticated styling with its unique fluted edge detail on the top and the clean lines of the bases. All this with the warmth of genuine wood veneer. Perfect for a waiting room or office lounge. Lesro's newly redesigned Siena series features matching tables to compliment the seating. 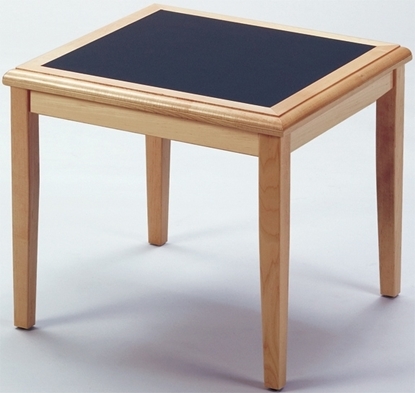 This stylish end table offers a functional tempered glass top and clean lines. Perfect for a waiting room or office lounge.